Acrylic artist starter set includes everything you need to begin making beautiful paintings from your home or art studio. Grow as an artist and a painter with this beginner acrylic paint set. 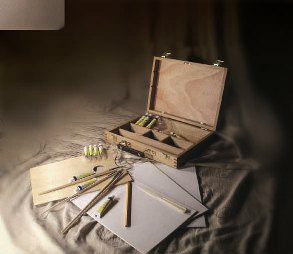 Complete with everything you need to make your first acrylic paintings, this set includes twelve 12 ml acrylic paint tubes in vibrant colors, a wooden palette for mixing paints, 4 acrylic paint brushes (sizes 2, 4, 6 and 8), 3 canvasboard panels measuring 20x30cm, a pencil and plastic palette knife. All this is packaged in an attractive and space efficient 5 compartment wooden box that holds everything neatly in place. Use this paint set in your art studio, in a painting class or even take it with you to paint live subjects. This acrylic paint set makes a perfect holiday gift for aspiring artists or experienced artists who have not yet experimented with acrylic paint.